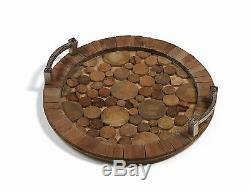 Loon Peak Reclaimed Wood/Metal Serving Tray. Overall Width - Side to Side: 20. Overall Depth - Front to Back: 20. Overall Height - Top to Bottom: 5. The item "Loon Peak Reclaimed Wood/Metal Serving Tray" is in sale since Saturday, July 01, 2017. This item is in the category "Home & Garden\Kitchen, Dining & Bar\Dinnerware & Serving Dishes\Trays". The seller is "wayfair" and is located in Panorama City, California.